There are many local, state, and national organizations working to make things better for LGBT people, and change is happening every day. 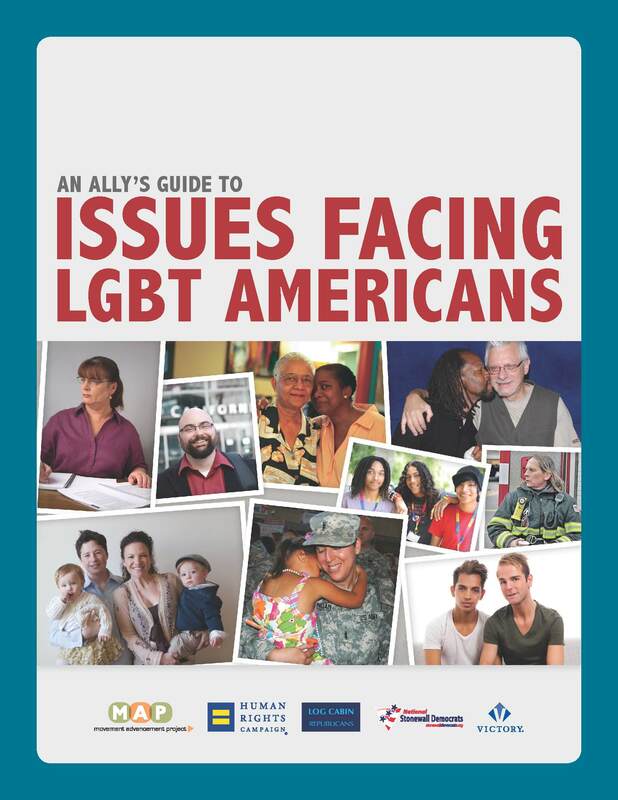 Our report, An Ally’s Guide to Issues Facing LGBT Americans, provides an introduction to the issues facing LGBT people and the opportunities for change. Check out these organizations which advocate for the entire LGBT community or a particular subset of the LGBT community on a broad range of issues. Audre Lorde Project works for community wellness and progressive social and economic justice on behalf of lesbian, gay, bisexual, two spirit, trans and gender non-conforming people of color in the New York City area through community organizing, education and capacity-building. Committed to struggle across differences, the Audre Lorde Project seeks to responsibly reflect, represent and serve its various communities. COLAGE provides support and advocacy organization for children with LGBT parents. Family Equality Council ensures equality for LGBT families by building community, changing hearts and minds, and advancing social justice for all families. Gay & Lesbian Victory Fund and Leadership Institute works to change the face and voice of America's politics and achieve equality for LGBT Americans by increasing the number of openly LGBT officials at all levels of government and to achieve full equality for LGBT people by building, supporting and advancing a diverse network of LGBT public leaders. Human Rights Campaign (HRC) is America’s largest civil rights organization working to achieve lesbian, gay, bisexual and transgender equality. HRC seeks to improve the lives of LGBT Americans by advocating for equal rights and benefits in the workplace, ensuring families are treated equally under the law and increasing public support among all Americans through advocacy, education and outreach programs. Keshet is a national grassroots organization that works for the full inclusion of LGBT Jews in Jewish life. Log Cabin Republicans works within the Republican Party to advocate for equal rights for gay and lesbian Americans. Movement Advancement Project is an independent think tank that provides rigorous research, insight and analysis that help speed equality for LGBT people. National Black Justice Coalition is a civil rights organization dedicated to empowering Black LGBT people. National Center for Transgender Equality works to end discrimination and violence against transgender people through education and advocacy on national issues of importance to transgender people. National Queer Asian Pacific Islander Alliance is a federation of LGBTQ Asian American, South Asian, Southeast Asian and Pacific Islander Organizations. National Stonewall Democrats is America's only grassroots Democratic LGBT organization. PFLAG promotes the health and well-being of LGBT persons, their families and friends through support, to cope with an adverse society, education, to enlighten an ill-informed public, and advocacy, to end discrimination and to secure equal civil rights. Services & Advocacy for GLBT Elders (SAGE) leads in addressing issues related to LGBT aging. The Task Force builds political power in the LGBT community from the ground up by training activists, organizing broad-based campaigns to defeat anti-LGBT referenda and advance pro-LGBT legislation, and building the movement's organizational capacity. Unid@s, The National Latin@ LGBT Human Rights Organization, creates a multi-issue approach for advocacy, education and convening of and for LGBT Latino communities. Check out these organizations which advocate for the entire LGBT community or a particular subset of the LGBT community on a particular issue or related set of issues. Freedom to Marry is the campaign to win marriage nationwide. By pursuing its Roadmap to Victory, Freedom to Marry works to win the freedom to marry in more states, grow the national majority for marriage and end federal marriage discrimination. Gay & Lesbian Alliance Against Defamation (GLAAD) amplifies the voice of the LGBT community by empowering real people to share their stories, holding the media accountable for the words and images it presents, and helping grassroots organizations communicate effectively. Gay, Lesbian and Straight Education Network (GLSEN) strives to assure that each member of the school community is valued and respected, regardless of sexual orientation or gender identity/expression. GMHC offers hands-on support services in New York City and education and advocacy about HIV/AIDS for hundreds of thousands nationwide. Gay-Straight Alliance Network empowers youth activists to fight homophobia and transphobia in schools. Immigration Equality seeks to end discrimination in U.S. immigration law, reduce its negative impact on the lives of LGBT and HIV-positive people, and help obtain asylum for those persecuted in their home countries based on their sexual orientation, transgender identity, or HIV status. National Coalition for LGBT Health is committed to improving the health and well-being of LGBT individuals through federal advocacy that focuses on research, policy, education and training. New York City Gay and Lesbian Anti-Violence Project works to eliminate hate violence, sexual assault, stalking and domestic violence in LGBT, queer andHIV-affected communities through counseling, advocacy, organizing and public education. Out & Equal Workplace Advocates educates and empowers organizations, human resources professionals, employee resource groups and individual employees through programs and services that result in equal workplace policies, opportunities, practices and benefits, and which include all sexual orientations, gender identities, expressions and characteristics. Point Foundation provides financial support, mentoring, leadership training, and hope to meritorious students who are marginalized due to sexual orientation, gender identity, or gender expression. OutServe-Servicemembers Legal Defense Network (SLDN) works to end discrimination against and harassment of military personnel affected by Don’t Ask, Don’t Tell and related forms of intolerance through national nonprofit legal services, watchdog activities, and policy advocacy. Soulforce works to end religion-based discrimination against the LGBTQ community through relentless, nonviolent, direct action. The Trevor Project is determined to end suicide among LGBTQ youth by providing lifesaving and life-affirming resources, including a nationwide, 24/7 crisis intervention lifeline, a digital community and advocacy/educational programs that create a safe, supportive and positive environment for everyone. Check out these organizations that support, list, and can help connect you with local organizations, including LGBT community centers and state-level equality groups. Equality Federation works to achieve equality for LGBT people in every state and territory by building strong and sustainable statewide organizations in a state-based movement. Check out these organizations which provide legal services to LGBT people and/or advocate and litigate within the legal system for LGBT people. ACLU LGBT & AIDS Project works to create a society in which LGBT people enjoy the constitutional rights of equality, privacy and personal autonomy, and freedom of expression and association. Gay & Lesbian Advocates & Defenders (GLAD) is New England’s leading legal rights organization, and GLAD is dedicated to ending discrimination based on sexual orientation, HIV status, and gender identity and expression. Lambda Legal seeks to achieve full recognition of the civil rights of LGBT people and those with HIV through impact litigation, education and public-policy work. National Center for Lesbian Rights advances the civil and human rights of LGBT people and their families through litigation, policy advocacy, and public education. Sylvia Rivera Law Project works to guarantee that all people are free to self-determine their gender identity and expression, regardless of income or race and without harassment, discrimination or violence. Transgender Law Center connects transgender people and their families to technically sound and culturally competent legal services, increases acceptance and enforcement of laws and policies that support California’s transgender communities, and works to change laws and systems that fail to incorporate the needs and experiences of transgender people.